This example shows how to create two buttons to fill up two particular colum in an Excel spreadsheet. Create a collection object (Class) grouping the "click" command ofeach button in a single sub. It is part of collections of objects on a sheet and not a UserControl. Making use of collection class for events with an additional collecion objects for the properties. Published by jak58. Latest update on October 31, 2012 at 06:12 PM by Jean-François Pillou. 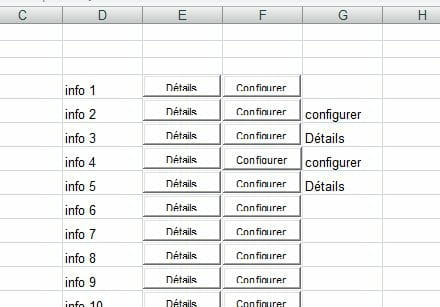 This document, titled "VBA - Create a series of buttons on a Excel worksheet," is available under the Creative Commons license. Any copy, reuse, or modification of the content should be sufficiently credited to CCM (https://ccm.net/).